Between rising tuition fees and the never-ending stream of financial horror stories about student debt and graduate struggles, the idea of college can be nerve-racking. Many students are reliant on financial assistance to survive college, but student loans often bring a heavy financial burden. This is where scholarships can help. Scholarships are fairly abundant, but it is up to students to find the scholarship opportunities that are right for them. But many students don’t even try. The results of a survey conducted by FluidReview show that more than half (56%) of surveyed undergraduates had not applied for a scholarship that year. 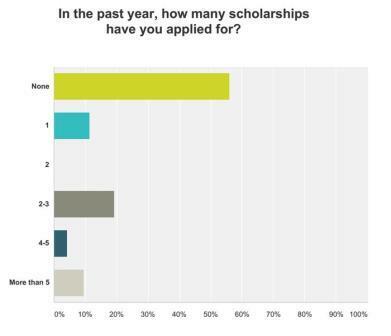 This sparks the question: Why are students not applying for scholarships? After reviewing the data, it can be concluded that many students have misguided views when it comes to seeking scholarships. Some of the most common misconceptions are explored below. Students often believe they are not qualified to receive assistance, causing them to miss out on potential scholarship opportunities. The truth is, there are many scholarships available, and not all scholarships are merit-based or dependent on top-notch grades. However, universities do not always make scholarship opportunities easy to find, so students are often unaware of awards which they may be perfectly qualified to receive. As technology has advanced, universities and organizations are utilizing software and tools designed for scholarship management to make it easier for students to find scholarship opportunities. This should progressively make the entire process much easier for everyone. While the belief that the scholarship application process takes a long time is not entirely false, it is important for students to be shown the big picture. The survey reports that 84% of scholarship applications are completed within three hours; if an applicant were to win a US$500 scholarship for a day’s worth of work, they would have made $62.50/hour. So yes, the process can be time-consuming, but the time spent applying can certainly pay off. Investing a few hours per day into scholarship applications can set a student up with enormous opportunities in the future. Thanks to new technologies, scholarship applications are becoming more unified, increasingly allowing students to apply for multiple scholarships at the same time. The survey results indicate that 45% of students have problems finding a scholarship they are eligible for, reporting the process as “difficult” or “very difficult”. This is understandable, since there are simply so many different scholarship opportunities, but often it’s hard to sort through to find the relevant ones. Additionally, the survey shows that 75% of students are using scholarship information provided by their own university. This is good in one sense, but comes with a concern that universities may not be passing on information about the rising number of private scholarships on offer. Students must therefore take it upon themselves to search beyond their university for external scholarships. One good way of keeping up is to subscribe to scholarship-based social media accounts and keep an eye out for daily updates. The options are out there, but it is up to everyone involved to work together to find them. Thank you for reading! Let’s continue the conversation in the comments below! What are scholarship obstacles are you facing? What tips would you share with other students? All graph images are courtesy of FluidReview. Taylor Tomita is a creative writer based in Boise, Idaho, US. When he’s not writing you can find him traveling with his band or searching the town for good pizza. Hi, I am from Jamaica the Caribbean How can I apply for an undergraduate scholarship to study in Spain or Australia? Hi Anneisha, please take a look at our lists of scholarships to study in Europe (where you'll find options to study in Spain) and scholarships to study in Australia. For advice on how to apply for a scholarship, please check out our guide. Hope this helps! Hi Marie I am from Namibia currently still in school and would like to further my schooling and studying in Germany if possible, How can I go about it? Suggest some cheap and good computer engineering colleges in United States. Hello, have you seen our new world rankings by faculty for Engineering and Technology? You can narrow the results down by country to see how the US universities rank. To help with costs, you might like to consider applying for a scholarship. We have an article listing scholarships to study Engineering, which includes scholarships available in the US. Hi, I'm Marie from Pakistan, I did B.com 2 years and want to study further, but don't afford fee so I just want free education,don't know how to apply,n what's the procedure for scholarship,plz need help can someone guide me ?